Siberian huskies and reindeer have now entered the ranks of the Russian Northern Fleet’s contingent in the Arctic to potentially form special units capable of getting the troops to remote locations inaccessible by other means of transport. The Arctic-motorized infantry brigade of Russia’s Northern Fleet held the first training exercises using husky dogs and reindeer near the village of Lovozero in the Murmansk region. The footage released by the Russian Ministry of Defense shows soldiers practicing sledging exercises using traditional transport with Arctic animals in freezing -30 degrees Celsius. The soldiers completed all the exercised with the animals with the help of local native herders. Scouts trained their control of the animal-drawn sledges and worked on tactical elements of the raid action with their use. Experienced mushers among Arctic reindeer herders shared centuries old skills on how to manage the animals with the Russian soldiers. At the end of the day, the animals have safely delivered the reconnaissance troops to a warm campout, where traditional nomadic tents known as chums were quickly erected in the extreme Arctic conditions within just 15 minutes. Using Arctic animal transport is one of the only means available for Russian troops in the region, as snowmobiles tend to break down or run out of gas in the rugged terrain and sub-freezing temperatures. After decades of desolation, restoration of the Russian military infrastructure in the Arctic began in 2012. The Defense Ministry is building or restoring facilities on the continent and the Arctic islands, from Franz Josef Land to the Bering Strait. Russian troops will be deployed in the Arctic by 2018, equipped with all the necessary high-tech weaponry, and arctic animals at their side. During World War II the Soviet Army established the world’s only reindeer transport battalions. More than 10,000 reindeer were mobilized to the Karelian Front, the only successful major military operation ever undertaken in an Arctic environment in modern warfare. Thousands of indigenous people in northern arctic Russia helped guide the animals via hardly accessible areas of the North. Nenets, as well as reindeer herders from Murmansk, Arkhangelsk and Komi districts were mobilized to the front. 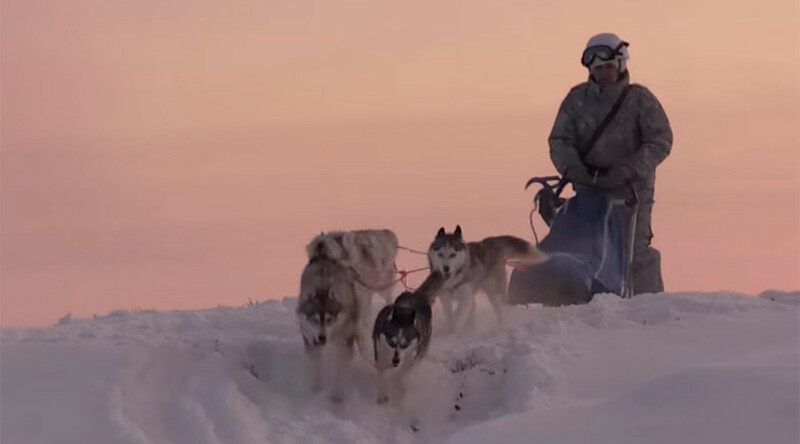 The effort of the Arctic animals have helped save more than 10,000 wounded soldiers, while also managing to safely deliver around 17,000 tons of ammunition and other vital cargo. The reindeer were also used infiltrate some 8,000 Soviet scouts behind the enemy’s lines.